Mufasa & Scar. . Wallpaper and background images in the Der König der Löwen club tagged: lion king. where do you find stuff like this? like pics and other family members, etc? I just go on to Gooogle Images, and type in whoever and it comes up. Nice picture of Mufassa and Scar! Young Mufassa looks like Young Simba. Cool! But Mufasa really looks like Simba as a cub... Maybe the eyes can be better, but it's very cool! 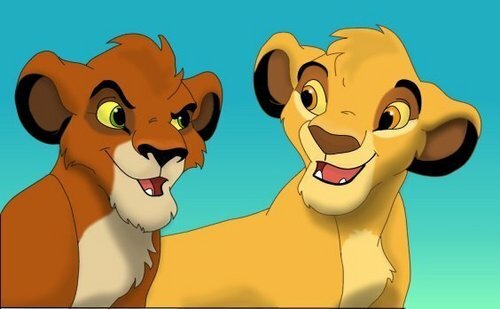 and scare killed muffassa when simba was still a cub. ^They hate each other because Mufasa got to be king and it was supposed to be Scar as he is the oldest, so he hated his brother for it. Mufasa is older than Scar, Okami_Amaterasu. Wow, Scar looks like Kovu & Mufasa looks like Simba! Aww I love this picture!! scar does look like kovu because i think he was kovu's father, just like mufasa is simba's dad. A Fluffy version of Simba!!! !